Bubble Jewelry - This is a handcrafted beautiful sterling silver pendant that that features a freshwater cultured white coin pearl (13mm). This showy statement necklace comes with an 18" snake chain. 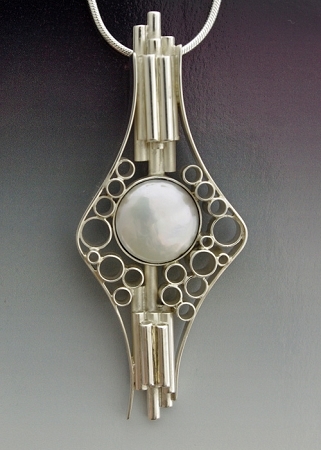 A Sterling Silver classic style pendant with a white fresh water coin pearl. The pearl is approximately 13 mm in diameter . The pendant is shown with an 18'' Sterling Silver snake chain.